When people with life threatening illnesses and their carers ask about prognosis (“How long have I got?”), they are often doing more than simply inquiring about life expectancy. Within this question is another, often unspoken, question about likely patterns of decline (“What will happen?”). One aid to answering both questions may be through the use of typical illness trajectories. Thinking in terms of these trajectories provides a broad timeframe and patterns of probable needs and interactions with health and social services that can, conceptually at least, be mapped out towards death. Such frameworks may help clinicians plan and deliver appropriate care that integrates active and palliative management. If patients and their carers gain a better understanding by considering illness trajectories this may help them feel in greater control of their situation and empower them to cope with its demands. An important implication for service planners is that different models of care will be appropriate for people with different illness trajectories. We review the main currently described illness trajectories at the end of life and draw out key clinical implications. A century ago, death was typically quite sudden, and the leading causes were infections, accidents, and childbirth. Today sudden death is less common, particularly in Western, economically developed, societies. Towards the end of life, most people acquire a serious progressive illness—cardiovascular disease, cancer, and respiratory disorders are the three leading causes—that increasingly interferes with their usual activities until death. 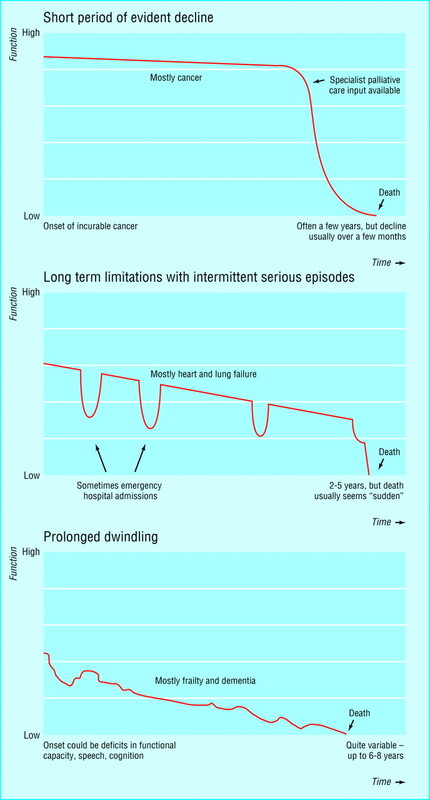 Three distinct illness trajectories have been described so far for people with progressive chronic illnesses (fig 1)2–6: a trajectory with steady progression and usually a clear terminal phase, mostly cancer; a trajectory (for example, respiratory and heart failure) with gradual decline, punctuated by episodes of acute deterioration and some recovery, with more sudden, seemingly unexpected death; and a trajectory with prolonged gradual decline (typical of frail elderly people or people with dementia). Typical illness trajectories for people with progressive chronic illness. Adapted from Lynn and Adamson, 2003.7 With permission from RAND Corporation, Santa Monica, California, USA. We now consider each of these three trajectories in more detail. This entails a reasonably predictable decline in physical health over a period of weeks, months, or, in some cases, years. This course may be punctuated by the positive or negative effects of palliative oncological treatment. Most weight loss, reduction in performance status, and impaired ability for self care occurs in patients' last few months. With the trend towards earlier diagnosis and greater openness about discussing prognosis, there is generally time to anticipate palliative needs and plan for end of life care. This trajectory enmeshes well with traditional specialist palliative care services, such as hospices and their associated community palliative care programmes, which concentrate on providing comprehensive services in the last weeks or months of life for people with cancer. Resource constraints on hospices and their community teams, plus their association with dying, can limit their availability and acceptability. Box 1 illustrates this trajectory. With conditions such as heart failure and chronic obstructive pulmonary disease, patients are usually ill for many months or years with occasional acute, often severe, exacerbations. Deteriorations are generally associated with admission to hospital and intensive treatment. This clinically intuitive trajectory has sharper dips than are revealed by pooling quantitative data concerning activities of daily living.4 Each exacerbation may result in death, and although the patient usually survives many such episodes, a gradual deterioration in health and functional status is typical. The timing of death, however, remains uncertain. In one large study, most patients with advanced heart failure died when expected to live for at least a further six months.8 Many people with end stage heart failure and chronic obstructive pulmonary disease follow this trajectory, but this may not be the case for some other organ system failures. Box 2 illustrates this trajectory. This third trajectory is of progressive disability from an already low baseline of cognitive or physical functioning. Such patients may lose weight and functional capacity and then succumb to minor physical events or daily social “hassles” that may in themselves seem trivial but, occurring in combination with declining reserves, can prove fatal.9 10 This trajectory may be cut short by death after an acute event such as a fractured neck of femur or pneumonia. Box 3 illustrates this trajectory. Trajectories allow us to appreciate that “doing everything that can be done for a possible cure” may be misdirected. Optimising quality of life before a timely, dignified, and peaceful death are the primary aims of palliative care. Understanding and considering trajectories may help professionals take on board, at an earlier stage than would otherwise be the case, that progressive deterioration and death are inevitable. Before the terminal stages of a disease, some health professionals may allow the reality of the prognosis to remain unconsidered or unspoken, unwittingly colluding with patients and relatives in fighting death to the bitter end.11 Patients often want palliative oncological treatment even if it is extremely unlikely to benefit them, and doctors usually offer it to maintain hope as well as to treat disease.12 An outlook on death and expectations that are more acquiescent to reality may moderate the “technological imperative,” preventing unnecessary admissions to hospital or aggressive treatments. A realistic dialogue about the illness trajectory between patient, family, and professionals can allow the option of supportive care, focusing on quality of life and symptom control to be grasped earlier and more frequently. 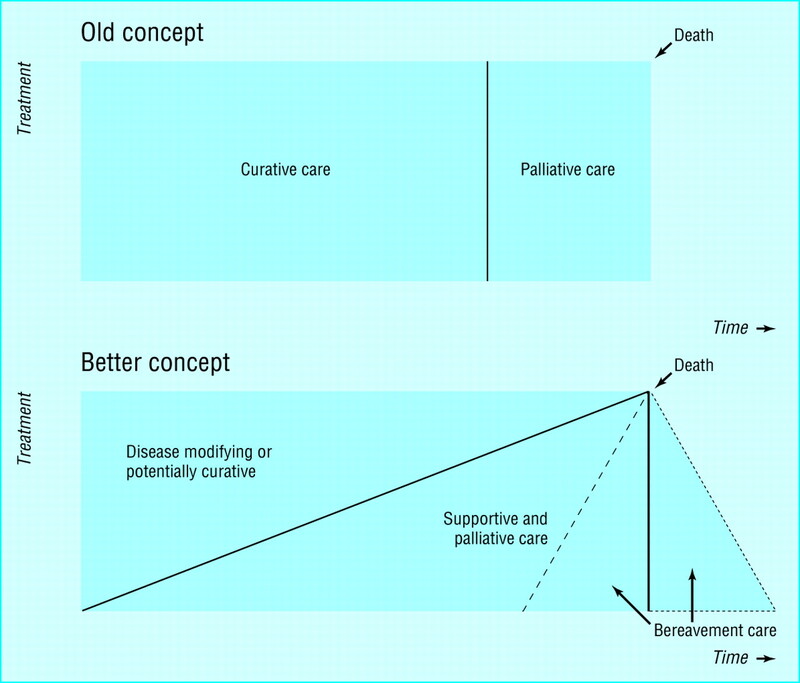 Figure 2 illustrates how the idea that palliative care is relevant only to the last few weeks of life is being replaced with the concept that the palliative care approach should be offered increasingly alongside curative treatment, to support people with chronic progressive illnesses over many years. CC, a 51 year old male shop assistant, complained of night sweats, weight loss, and a cough. An x ray initially suggested a diagnosis of tuberculosis, but bronchoscopy and a computed tomography scan revealed an inoperable, non-small cell lung cancer. He was offered and accepted palliative chemotherapy when he had already lost considerable weight (too much to allow him to enter a trial). The chemotherapy may have helped control his breathlessness, but he was subsequently admitted owing to vomiting. Looking back, CC (like several other patients in our study) expressed regret that he had received chemotherapy: “If I had known I was going to be like this….” His wife felt they had lost valuable time together when he had been relatively well. CC died at home three months after diagnosis, cared for by the primary care team, night nurses, and specialist palliative care services. His death had been discussed openly. He and his wife were confident that nursing, medical, and support staff would be available. Mrs HH, a 65 year old retired bookkeeper (photo), had been admitted to hospital several times with cardiac failure. She was housebound in her third floor flat and cared for by a devoted husband who accepted little help from social work or community nursing. Previously she had been very outgoing, but she then became increasingly isolated. Her major concern was that her rapidly deteriorating vision because of diabetes prevented her completing crosswords, not that she had stage IV heart failure. Her treatment included high dose diuretics and long term oxygen therapy. She required frequent blood tests. She had raised her prognosis indirectly with her general practitioner, by mentioning to him that her grandson had asked her if she would be around at Christmas. Prognostic uncertainty was a key issue for many heart failure patients and their carers in our study, as illustrated by the following quotations. “I take one step forward, then two steps back.” 84 year old, male, retired engineer, living alone, several recent admissions to hospital. “I'd like to get better, but I keep getting worse.” 72 year old widow, living alone, psoriasis and arthritis. “Things I used to take for granted are now an impossible dream.” 75 year old man, large family nearby, recently celebrated 50th wedding anniversary. “There were times last year, when I thought I was going to die.” 77 year old woman, living alone, several periods in hospital with acute breathlessness. “It could happen at any time.” Wife of 62 year old former footballer and taxi driver. “I know he won't get better, but don't know how long he's got.” Wife of 77 year old retired flour mill worker with severe asthma. Mrs HH died on the way home from a hospital admission due to a nosebleed. She had had these occasionally as she had hypertension and a perforated nasal septum. Attempted resuscitation took place in the ambulance. Her husband later expressed deep regret that his wife's clear wish not to have her life prolonged was not respected. Mrs LC, a 92 year old widow, lives alone in a ground floor flat in central Edinburgh. Bereaved 12 years ago, she is now housebound due to arthritis and general physical frailty. She used to venture out occasionally to the shops but over the years has felt less able and confident, largely because of a fear of falling. She appreciates the chair and walking aids supplied by the occupational therapist as these provide support and a sense of security at home. Since a “little fright” she had before Christmas when her legs gave way, she retires to bed earlier than before. She receives regular visits from friends and the local church and is undemanding of services. Current medications are paracetamol, thyroxin, and bendrofluazide (for hypertension) and an annual influenza vaccine. Dying at home is the expressed wish of around 65% of people at the beginning of the cancer and organ failure trajectories.13 An appreciation that all trajectories lead to death, but that death may be sudden (particularly in patients following trajectory 2), makes it evident that advanced planning is sensible. Eliciting the “preferred place of care” is now standard in some palliative care frameworks and helps general practitioners plan for terminal care where the patient and family wish. This may increase the likelihood of patients dying in the place of their choice, as was the case for CC (see box 1). Sensitive exploration is needed and can allow issues such as resuscitation status to be clarified and “unfinished business” to be completed for patients on all these trajectories. However, advance directives may be ignored in the heat of the moment.14 Mrs HH's death had (unusually in people with heart failure) been planned, but an emergency overtook the situation and she received inappropriate resuscitation as documentation was not at hand. Living wills (advance directives) may be becoming more popular with patients, but most primary care professionals still have relatively little experience with these (Polack C, personal communication, 2004). Such planning may be particularly relevant to people in the third trajectory, where progressive cognitive decline is common. Some patients attempt to gain control over their illness by acquiring knowledge about how it is likely to progress.15 16 Had CC (box 1), who had lung cancer, been aware of his likely course of decline he might have been less worried about a very protracted death. Similarly, his wife might have been less worried about a sudden death. Both gave clear cues in the research interviews that they were concerned about the possible nature of the death and would have welcomed sensitive discussion of this with health professionals. Some illnesses might follow none, any, or all of the trajectories: a severe stroke could, for example, result in sudden death or a fairly acute decline as in trajectory 1; a series of smaller strokes and recovery could mimic trajectory 2; while a gradual decline with progressive disability could parallel trajectory 3. Renal failure might represent a fourth trajectory consisting of a steady decline, with the rate of decline dependent on the underlying pathology and other patient related factors such as comorbidity.2 Patients with multiple disorders may have two trajectories running concurrently, with the more rapidly progressing trajectory typically taking centre stage. This is not uncommon in older patients with slowly progressive cancers. The trajectories we have considered relate to physical wellbeing. Other trajectories may exist regarding dimensions such as the spiritual or existential domain. In cancer patients, we have noted that spiritual distress and questioning may peak at diagnosis, again at the time of recurrence, and then later during the terminal stage. Spiritual distress in people with heart failure may, in contrast, be evident more uniformly throughout the trajectory, reflecting the gradual loss of identity and growing dependence.18 Psychological and social trajectories may also potentially be mapped. In dementia, the loss of cognitive function may cause parallel loss in activities of daily living, social withdrawal, and emotional distress. Different models of care will be appropriate for people with different illness trajectories. The typical model of cancer palliative care might not suit people who have a gradual, progressive decline with unpredictable exacerbations. People with non-malignant disease may have more prolonged needs, but these are as pressing as those of people with cancer. Uncertainty about prognosis should not result in these patients, and their families, being relatively neglected by health and social services.3 4 A strategic overview of the needs of and services available to people on the main trajectories may help policies and services to be better conceptualised, formulated, and developed to consider all people with serious chronic illnesses. The key to caring well for people who will die in the (relatively) near future is to understand how they may die, and then plan appropriately. Since diseases affect individuals in different ways, prognosis is often difficult to estimate. None the less, it seems that patients with specific diseases and their carers often have common patterns of experiences, symptoms, and needs as the illness progresses. The notion of typical or characteristic trajectories is therefore conceptually sustainable and borne out in our longitudinal qualitative studies. Three typical trajectories have been described so far, and others may be characterised soon. More research is now needed to help understand how the insights offered by these trajectories can be translated into improvements in outcomes for patients and their families. In Hippocrates' day, the physician who could fore-tell the course of the illness was most highly esteemed, even if he could not alter it.24 Nowadays we can cure some diseases and manage others effectively. Where we cannot alter the course of events we must at least (when the patient so wishes) predict sensitively and together plan care, for better or for worse. Lynn J, Schuster JL, Kabcenell A. Improving care for the end of life: a sourcebook for health care managers and clinicians. New York: Oxford University Press, 2000.
WHO Europe. Better palliative care for older people. Copenhagen: WHO, 2004. Thomas K. Caring for the dying at home. Companions on a journey. Oxford: Radcliffe Medical Press, 2003. Lynn J. Sick to death and not going to take it any more. Reforming health care for the last years of life. Berkeley, Ca: University of California Press, 2004. DIPEx. Personal experiences of health and illness (http://www.dipex.org/)—allows patients and carers to learn about cancer and other illnesses through sharing other people's personal experiences. BBC Online. Health (www.bbc.co.uk/health)—gives information on a range of illnesses and conditions. Growth House Inc (www.growthhouse.org/)—provides patients and professional resources for life-threatening illness and end of life care. UK Self Help (www.ukselfhelp.info/)—provides a list of UK self help websites. Lynn J, Harrold J. Handbook for mortals: guidance for people facing serious illness. New York: Oxford University Press, 1999. We would like to acknowledge the pioneering work of Joanne Lynn and colleagues at the Washington Home Centre for Palliative Care Studies, and June Lunney and colleagues at the National Institute of Aging, National Institutes of Health, Bethesda, USA, in the area of illness trajectories. Contributors All authors wrote the paper. MK provided the research data. SAM is the guarantor. Funding The Chief Scientist Office, Scottish Executive, funded the original research. Ethical approval The local ethics committee and primary care and hospital trusts granted ethical approval. .Dying of lung cancer or cardiac failure: prospective qualitative interview study of patients and their carers in the community.BMJ2002; 325:929–32. .Patterns of dying: palliative care for non-malignant disease.Clin Med2004; 4:39–44. .Palliative care: the solid facts.Europe:WHO,2004. .Patterns of functional decline at the end of life.JAMA2003; 289:2387–92. .How long can I go on like this? Dying from cardiorespiratory disease.Br J Gen Pract2004; 54:892–3. .Predicting survival in patients with advanced disease. In Doyle D, Hanks G, Cherny N, Calman K, eds. Oxford textbook of palliative medicine.Oxford:Oxford University Press,2004. .Living well at the end of life. Adapting health care to serious chronic illness in old age.Washington:Rand Health,2003. .The last six months of life for patients with congestive heart failure.J Am Geriatr Soc2000; 48:S101–9. .Cumulative trivia: exploratory focus group work.Edinburgh:Edinburgh University,2001. .Life events and daily hassles and uplifts as predictors of hospitalisation and out patient visitation.Soc Sci Med1992; 34:763–8. .The diagnosis of dying.J R Coll Physicians Lond1999; 33:110–2. .Attitudes to chemotherapy: comparing views of patients with those of doctors, nurses and general public.BMJ1990; 300:1458–60. .Place of care in advanced cancer.J Palliat Med2004; 3:287–300. .Difficult end-of-life treatment decisions: do other factors trump advance directives?Arch Intern Med2004; 164:1531–3. .Patient power and control: a study of women with uncertain illness trajectories.Qual Health Res2004; 14:226–40. .Parents' perceptions of chronic illness trajectories.Canadian J Nurs2000; 32:19–36. .Do general practice patients with heart failure understand its nature and seriousness, and want improved information?Patient Educ Couns2001; 45:181–5. .Exploring the spiritual needs of people dying of lung cancer or heart failure: a prospective qualitative interview study of patients and their carers.Palliat Med2004; 18:39–45. .Learning to care for people with chronic illness facing the end of life.JAMA2000; 284:2508–11. .Caring for the dying at home. Companions on a journey.Oxford:Radcliffe Medical Press,2003. .Care of the dying: A pathway to excellence.Oxford:Oxford University Press,2003. .Care of people dying with malignant and cardiorespiratory disease in general practice.Br J Gen Pract2004; 54:909–13. .Specialist palliative care and patients with non-cancer diagnosis: the experience of a service.Palliat Med2001; 15:413–8. .The nature of suffering.New York:Oxford University Press,1991.